Signals: A Russian-backed Congress in Sochi for Future Peace in Syria? Posted byDr Helene Lavoix (MSc PhD Lond) November 24, 2017 October 16, 2018 Leave a comment on Signals: A Russian-backed Congress in Sochi for Future Peace in Syria? As stated by Russian President Putin, the overarching goal is now, for Syria, “the political settlement process, with the finalization of the Geneva talks and assistance for the country’s post-conflict recovery.” Within this mission, the Russian, Iranian and Turkish leaders decided to support an inclusive process leading to a new constitution for Syria, as well as free and fair elections. The way to achieve these goals is first, as initiated by the Russian President and now officially supported by the other leaders, to convene a “Syrian national dialogue congress in Sochi in near future”. The complex task will be to choose whom to invite as well as to convince all Syrian actors to participate. What we see at work is a very progressive road map, where “baby steps” are taken, but each becoming a solid foundation upon which to build the next one. We are thus still relatively far away from a successful peace agreement. Indeed, four major hurdles, with different positions on each of them by Syrian and external actors, have to be faced and overcome: the fate of the Syrian Kurds-led SDF and its Federation of Northern Syria, which holds around 25% of the Syrian territory; acceptance of the Congress idea by a united Syrian opposition as decided in Ryadh and that would regroup the Ryadh, Moscow and Cairo platforms (current conflicting reporting from various sources would suggest that their 23 November declaration does not mean the end of the idea of a Congress in Sochi); the presence and activity of Iran and its ally Hezbollah on the future peaceful Syrian territory; the political role of Bashar-al Assad in a future Syria. 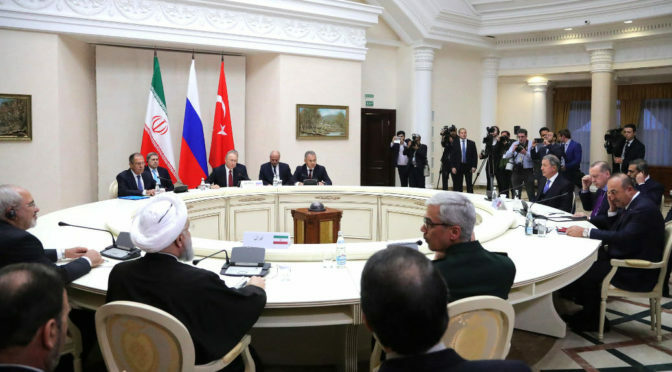 As looks obvious, actually, these demands and hurdles are not all on the same timeline, hence most probably Russia’s initiative for such a Congress, as well as Russia’s ability to garner support for the idea from Iran and Turkey. Indeed, the Congress is about discussion and this is the lowest common denominator possible. It means getting all actors to accept discussing, rather than getting all actors to agree on something, although some form of agreement will also be necessary at one stage. But obtaining some agreements will be part of a second step, once actors have started discussing. As a result, convening a Congress first has a higher likelihood of success compared with organising immediately talks in Geneva that directly aim at agreeing on a specific peace and that would have directly to confront head on irreconcilable demands. A congress in Sochi is not opposed to peace talks in Geneva, on the contrary. It is a very progressive process, which will take the time needed and which may ideally end with peace talks in Geneva. Furthermore, assuming the Sochi idea completely fails, Geneva is not dragged into it and can still resume. The talks were devoted to the Syrian settlement process, taking into account the joint work in the Astana format. The participants in the meeting discussed further steps to ensure the long-term normalisation of the situation in Syria. A joint statement by the presidents of Iran, Russia and Turkey was adopted following talks. RIYADH/AMMAN (Reuters) – Syria’s main opposition stuck by its demand on Thursday that President Bashar al-Assad play no role in an interim period under any U.N.-sponsored peace deal, despite speculation it could soften its stance because of Assad’s battlefield strength.